The Error'd series on what-used-to-be-TheDailyWTF occasionally features some magnificently huge error boxes. 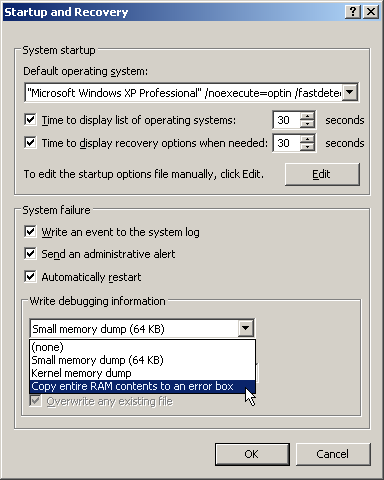 I think the second one in this post has to be the record-holder: A standard Windows error box, 401 by 737 pixels in size. I, however, quite often see one with 3.8% more area, and even less usefulness. When the server that supports the excellent Pennypacker Penny-Arcade-indexing Firefox extension is down, the extension becomes unhappy. ...every time you look at a PA comic page. That's 683 by 449 pixels, folks. 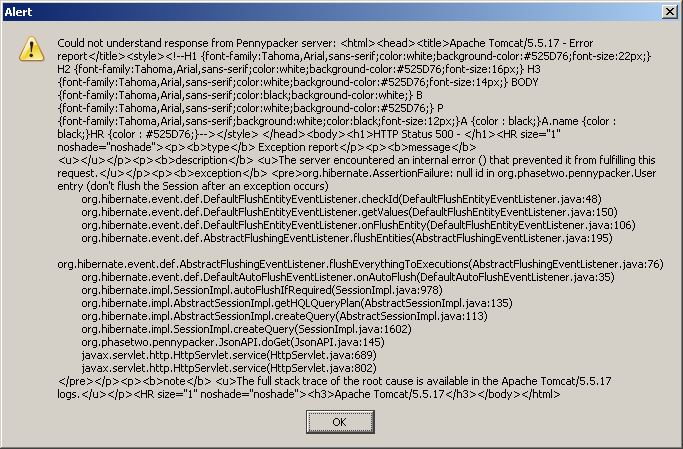 Ahh, the lovely Penny Packer error. I'm glad I'm not the only one that gets that lovely beast. I bet if I were a psych major or something I could write some really interesting stuff about the overcrowding/outcasting of internet communities. Alas, I am not so I shall just sit here and type randomness in your blog. This sort of error will likely become increasingly common as (a) people write more AJAX-y stuff and (b) people use server software which causes increasingly longwinded errors. Something I wrote a while ago would occasionally treat the user to a very, very long Common Lisp stack trace, though I think it was inserted into text box or something rather than a message box. A new Windows config option suggests itself. It reads very much like a long winded Holkins post. Only more entertaining. Looks like the PennyPacker servlet is flaky in general. A few page refreshes and I get a different error. The message you see is quite small, however, when you compare it to a stack trace from something more "enterprise" like IBM's Websphere Application Server. That can give 100 lines or more! I've never measured it exactly but a particularly flaky app-that-shall-remain-nameless (at v1.2 I should point out, no v0.1 "use it on your own risk" beta...) that we use at work once gave me an error that covered about 800 pixels width and 6 screens of height on a 1600x1200 monitor. I had to right-click on the menu bar and use 'move' just to see the 'OK' button. I think I've still got the stitched-together screenshot that I did for the disbelieving developers. Its other speciality was the 250 sequential .Net errors that it would do in another fairly common circumstance - I should point out that it would continue to work after these errors had been cleared. I remember back in my CS days, some guy was demoing his project to be marked and must have missed off a quotation mark somewhere, because when he went through testing the validation of some input, he got an error, followed by about 300 lines of source code. This was particularly amusing as he was also dumping all text output to a printer. A nice, noisy Epson dot-matrix. May God help me, I know what that error message is saying.